The following is an excerpt from an upcoming issue of The American Locator! Okay Tony, could you give us some background on your career? How did you get into the locating business, and how long have you been doing this? and did my initial training on major USAF bases in the UK where we were tasked with mapping all underground services across the six bases. These sites provided great training as they were very congested and were set up as small towns in their own right. There were multiple factors to consider such as live aircraft movements and security issues (police and Bomb Squad were called out to investigate my suspicious transmitter on a regular basis). 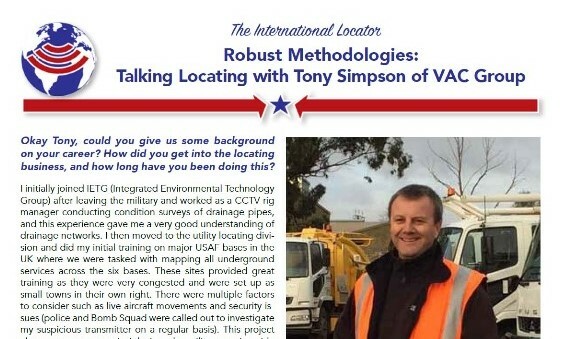 This project also gave me a great insight into the utility mapping side of the business using a bespoke software package called Survey Manager, which was an excellent system for collating data from multiple locators and tracking progress of a large project. IETG was then bought out and parts of the business were sold, so I decided at that point to move on. Check out more here in the current preview version of The American Locator!